The Raygun » War, What Is It Good For? A Quentin Tarantino film such as, say, Inglorious Basterds is always going to be a winner at theatrical and particularly on DVD, but when a war-themed title such as Metrodome’s Saint And Soldiers sells more than 700,000 units over a four year period, selling at least 1.000 units per week, a feat that’s all the more impressive when one considers its less than $1 million production budget, one senses that war, as a genre, is enjoying something of a purple patch. You can add that to HBO’s Band Of Brothers, which continues to sell and sell (it is the bestselling TV DVD box set ever), and it’s not surprising that, alongside the usual diet of horror and British gangster thrillers, war is the go-to genre for British distributors at film markets. Q4 sees a flurry of war-related activity, with Momentum’s brace of wildly differing war features – one a first world war tale from the trenches (Beneath Hill 60), the other a real-life documentary filmed during the recent Iraq war (This Is War) – being joined later by HBO’s The Pacific, the latest epic series from the team behind the blockbuster Band Of Brothers. So why have war films enjoyed such a resurgence in the DVD sector? The fact that war is, because of the situation in Iraq, Afghanistan and beyond, something that is very much at the forefront of people’s minds, has helped the genre gain in stature. For companies such as Momentum, Metrodome and High Fliers, the DTV element is a major factor. As Eldrett said: “I also believe it is a continuing result of an over saturated theatrical market, really good films are not getting their chance at the box office. 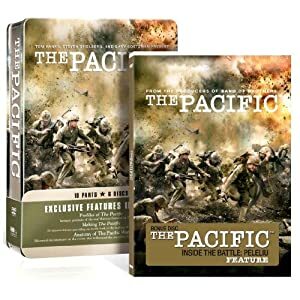 DVD as a genre (and latterly Blu-ray) has helped the genre emerge since its introduction; the quality has made war films seem so much more realistic. Saving Private Ryan and Band Of Brothers, which both boasted the involvement of Steven Spielberg and Tom Hanks, were the first of the current crop and both came as DVD was growing. The target market is arguably wider than the average actioner too, meaning a potentially wider audience. There’s the resonance and current feel of films such as This Is War, through to the older flavour of titles such as Beneath Hill 60. And that’s only taking in modern warfare. Epic, historical war films, from Asian swordplay movies through to titles such as High Fliers’ Arn: Knight Templar, have all proved their worth. As well as the traditional 18 to 35-year-olds, war films can pill in an older male audience too. “There is a small market of older consumers buying into this genre,” concurred Momentum’s Adam Eldrett. “With This Is War for example it is important to make an older History Channel viewer, Guardian reader aware of the film as it is a documentary they will find interesting, but to effectively sell the film to a younger DVD hungry audience it again needs to be aspirational to them. “We tap into the gaming world and the huge success of Call of Duty, Medal Of Honor, Ghost Recon to name a few and ensure our product looks appealing to that younger consumer. But while action and authenticity are important in design and marketing, you can’t go too far into exploitative imagery, especially given current conflicts and other sensitivities. So where next for the genre then? Well, there are a lot of people looking for war stories. As Metrodome’s Jezz Vernon said: “Like all consistently performing genres its been pounced upon by other distributors to varying degrees of success. “For us moving forward we are focused on the high quality premium experience, we’ve just seen a good DVD result for Lebanon – very much propelled from a fantastic critical response and we are gearing up now for Age Of Heroes which is a Metrodome co-production. Age Of Heroes distills the key selling points of the genre – it’s a British made feature about Ian Fleming’s formation of the 30 Commando in world war two – the unit that set the original template for the modern SAS. It stars Sean Bean and Danny Dyer and will release in 2011, it also happens to be stunningly good war film. “Saints And Soldiers has now sold 712,000 copies. It is a phenomenon and although we’ve had considerable success with other war titles its by far our most successful. For two years or so it was an emerging genre and when we saw Days Of Glory,our French war film about Algerian soldiers fighting for France in WWII, cross the 200,000 unit mark (now at 376,000 units sold) we realized there was an appetite.” Metrodome’s Jezz Vernon.